Arabian, or dromedary, camels would have been exotic creatures to the American public in 1907, when this wooden toy was introduced by the A. Schoenhut Company of Philadelphia. Part of a set of circus animals, the camel with its glass eyes, open mouth with painted teeth, leather ears, and woven tail is a link to a remarkable story of a young immigrant coming to the United States and creating an empire. Born in 1848, Albert Schoenhut came from a toy-making family in Wurtenberg, Germany. He was invited to come to Philadelphia in 1866 to repair toy pianos for the John Wanamaker department store. By 1872 he started his own toy piano company. This small company expanded to make other musical instruments, wooden “character” dolls, circus figures, doll houses and doll furniture, push and pull toys, and a wide variety of other toys. The Schoenhut factory grew from a small building on Frankford Avenue to larger quarters at Sixth and Adams Streets. By 1907 the factory expanded to five stories at Adams and Sepviva Streets, eventually enclosing five and a half acres of floor space. The factory employed 400 workers. 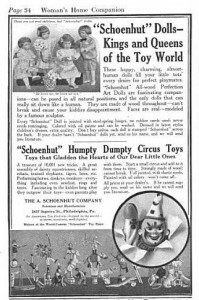 Before World War I, the period in which Philadelphia developed its reputation as the “Workshop of the World,” the Schoenhut toy company was the largest toy company in the United States. One of Schoenhut’s most popular toys was the Humpty Dumpty Circus set, sold from 1903 until 1935, when the company declared bankruptcy. Schoenhut used his genius for creating new toys to capture the interest of the buying public. The hand-painted circus toys connected to everyone’s love of the American circus with acrobats, clowns and preforming animals. The early animals had glass eyes and real hair for manes or tails. Performers had real hair and decorated costumes. The Ringmaster was the more elaborate of the performers; he wore a black top hat and clothing very much like an English fox hunting costume. The early elephant was one of the most decorative circus animals with painted leather tusks and ears. It wore a colorful howdahs blanket edged in metallic braid. All the animals and figures were jointed strung together with elastic bands, allowing them to be placed in a variety of positions only limited by imagination. The animals and performers could hold poses, stand on balancing ladders, and do a wide variety of “tricks” following the poses found in Schoenhut catalogs. Schoenhut sold the circus figures and accessories individually, in small boxed sets, or in large sets. The accessories could include performers, circus tents, circus wagons, and a wide range of animals. A child could receive a starter set and through continued gifts eventually own a complete circus of thirty-seven animals, ten performers (plus a band, which was an extra set), accessories and a circus tent. The toys provided hours of fun and had a whimsical charm that invited anyone to play. Text by Susan Drinan, who retired in 2015 as registrar of the Philadelphia History Museum at the Atwater Kent.